Caffeine is, along with nicotine and alcohol, one of the most widely used mood-affecting drugs in the world. It produces a response similar to the stress response in our bodies, but affects each person differently. For instance, it may cause some people to stay awake, but help induce sleep in others...very strange, I know! Caffeine is very addictive! It is a central nervous system stimulant which temporarily keeps us more awake and alert. It acts as a diuretic which means that it draws water from the body, so you may feel the need to go to the loo more often. A regular caffeine drinker’s body adapts to having caffeine all the time. It has to produce more adenosine, which is a brain chemical which stops the release of our natural stimulants, dopamine and adrenalin. What happens then is that when we don’t get our caffeine fix, we feel anxious, tired and unable to cope. This starts a vicious cycle which can have some serious health effects. It is interesting to know that as little as 100mg of caffeine a day - which is about 1 cup of coffee – is enough to cause withdrawal symptoms when we stop drinking caffeine. For a more detailed look at the side effects, please see my “caffeine side effects” page. Caffeine has the same side effects on children as it does on adults, only they are smaller and lighter than adults, so caffeine will have a more intense affect on them. In other words, drinking only a small amount of a caffeinated drink will have much more of an effect than it will on an adult. Children around the world love cola drinks, but often we don't realise that they are quite high in caffeine - which is hidden in quite a number of popular dinks today. It is highly advisable for children to avoid such drinks as studies have shown that it causes them to be more restless and hyperactive – so much so that the hyperactivity level is enough to meet the criteria for attention deficit disorder with hyperactivity (ADHD). Another study showed that children deprived of their daily intake had trouble thinking clearly, were lethargic and tended to get angry more often. Here is a handy table with some of the more common sources of caffeine. You can see approximately how much caffeine each item contains. Please note these amounts are not exact and will vary. 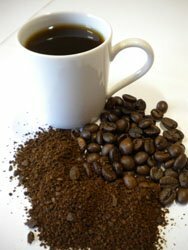 If you would like to learn more about the caffeine in coffee and tea, please click on this link. Can Caffeine Have Positive Effects? This may be good news if you love drinking coffee, but the research is not at the stage where you could say that you should drink coffee to increase your health. Personally, I think that it is not advisable to drink more than 2 cups of coffee a day, although no more than 1 cup of coffee, 2 cups of black tea or 3 cups of green tea is ideal. Drinking any more than that starts to put strain on your liver. Many people, in an effort to improve health, cut out coffee even though they really enjoy it, but studies suggest that focussing on good nutrition, exercise and not smoking are far more beneficial for improving overall health and well-being.So it seems that for most people, besides pregnant woman and people who have trouble controlling their blood sugar or blood pressure, coffee isn’t such a bad beverage choice for adults after all… but moderation is the absolute key. There is an ongoing debate about coffee: should you drink it or shouldn't you, or how much is ok to drink! For so many, coffee is more than just a warm drink. Why not tell us what your cup of coffee means to you and why you love it so much. Would you like to take part in my "Effects of Caffeine" survey? You will remain completely anonymous - none of your details will be given out to anybody, I promise. Thanks for taking the time to take part! I will post the results here and keep them updated as the results come in. I do hope you found this information about the effects of caffeine interesting and helpul in your quest for good health. If you have any questions or comments in relation to facts about caffeine, please contact me as I would love to hear from you.